Bring salted water to boil in a medium saucepan. Once it is boiling, add the spinach and cook just for a minute, until it completely wilts. Drain and squeeze out as much water as possible with cheesecloth, a clean kitchen towel, or a wooden spoon. When cool enough to handle, coarsely chop and set aside. Heat the olive oil and butter in a large skillet over medium heat, add the leek and scallions and cook for 4 to 5 minutes, until softened. Add the garlic, stir, and cook for a minute, until fragrant. Raise the heat to medium high, wait a minute, and add the sliced mushrooms. Sprinkle in a teaspoon salt and black pepper, let them brown for a minute or two, and continue to cook until they let out their juices and begin to brown again, 4 to 5 minutes more. Once their juices have almost evaporated, add the chopped spinach, mix well, and continue cooking for another 4 to 5 minutes, until all the spinach juices evaporate. Turn off the heat, set aside, and let cool to room temperature. In a small bowl, beat the eggs, add the requeson or ricotta cheese, the remaining teaspoon salt, and mix well. Combine with the spinach and mushroom mixture and set aside. Heat 2 tablespoons of olive oil in a large nonstick skillet set over medium-high heat and season the zucchini slices with about ½ teaspoon salt and pepper to taste. Once the oil is hot, working in batches, brown the zucchini slices for a minute or so per side and transfer to a platter covered with paper towels. Set aside when you are done. Reduce the heat to medium, add 2 more tablespoons of olive oil and the butter. Once the butter has melted, stir in the onions. Cook, stirring occasionally and scraping the bottom of the pan, for 7 to 8 minutes, until they have completely wilted and have browned around the edges. Add the poblano pepper strips and 1 teaspoon salt, stir, and continue to cook for another couple minutes. Make room in the middle of the pan, add the corn kernels and cook for a couple minutes, stirring to combine with the rest of the mix. Remove from the heat and taste for salt, adding more if need be. Set aside. Place the tomatoes, garlic and chiles in a medium saucepan, cover with water and bring to a boil over medium-high heat. Reduce heat to medium and simmer for about 10 minutes, until the tomatoes are cooked and mushy. Place the tomatoes, garlic and chiles into a blender, along with the onion and salt and process until completely smooth. Heat the oil in medium saucepan set over medium heat. Once the oil is hot, pour in the pureed tomato mixture, cover partially with a lid and simmer for 5 minutes, stirring here and there. Add the tomato paste and mix well. Pour in the chicken broth, stir, and cook for another 5 minutes, until well seasoned and thickened. Set aside. Generously butter a 9”x13” baking dish. Bring salted water to a boil in a large pot. Cook the lasagna noodles per package instructions, or for 8 to 9 minutes, stirring them as they cook so they won’t stick. Drain and immediately lay them out them on an oiled baking sheet. Set a rack in the middle of the oven and preheat to 375 degrees Fahrenheit. Spread about 1/2 cup tomato sauce onto the bottom of the buttered baking dish. 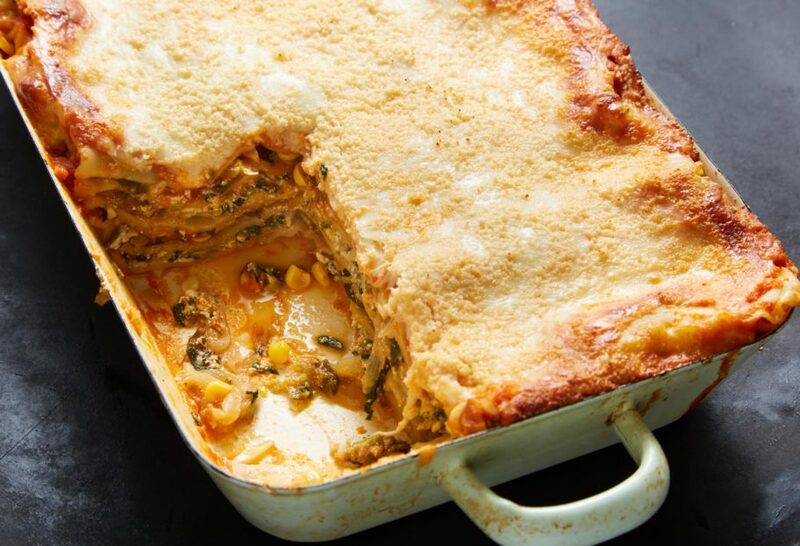 Place a layer of cooked lasagna noodles over the sauce, draping them so they coat the entire surface. Spread half the spinach and mushroom filling over the noodles. Place a second layer of cooked lasagna noodles. Top with half of the poblano and corn mixture and half of the zucchini slices. Cover with about a cup of the salsa roja. Place a third layer of cooked lasagna noodles. Top with the other half of the spinach and mushroom filling. Place a fourth layer of cooked lasagna noodles. Add the remaining half of the poblano and corn mixture, the rest of the zucchini slices, and about a cup of the salsa roja. Place fifth layer of cooked lasagna noodles and cover with the remaining cup of tomato sauce. Add the grated Oaxaca or mozzarella cheese, and top with the Cotija cheese or parmesano reggiano. Cover the baking dish loosely with aluminum foil, making sure it is tight all around the edges, but that there is a lot of space over the cheese - like a tent or bubble - so the aluminum is not very close to the cheese on top. Place baking dish on a baking sheet and put into the oven. Bake for 40 minutes, then carefully remove the aluminum foil and return to the oven for another 25 to 30 minutes. The top should have melted, browned and begun to crisp along the edges. Remove from the oven and let the lasagna sit for 10 minutes before cutting into it. Amazing recipe. Well worth the time and effort. My wife loved it! We’ll definitely make it again! OMG! This was amazingly delicious!! Yes, it took time but now that I have made it once, I will be able to do it slightly quicker next time, lol. We used whole wheat lasagna noodles and I hate using whole wheat noodles but they were even perfect in this recipe. Thank you for sharing Pati. Patti, absolutely LOVE your show!!!! I’m making 2 one veggie and one veggie for vegetarian daughter!! Awesome! I hope everyone loves the lasagna, Diana. Pati! My husband & I love watching your show! You make everything look delicious! We made the Veggie Loaded Mexican Lasagna a few nights ago. It was delicious! It took a long time to make tho. Thank u so much! I made this for Christmas Day tomorrow! Can’t wait to taste it and share with family! Wish I had made step by step picks, will do next time. Merry Christmas to you and your family! I hope you had a Merry Christmas too Phyllis. Have a Happy New Year! Have a yum holiday, Nan! Dearest Ms. Jinich: Saw it. Made it. LOVE it. I made the sauce the day before (two jalapenos, one seeded), which saved some time on the day of, and I substituted red chard for the spinach (better-looking and cheaper than the spinach at the market). SO worth the time. You make my heart moo-shy! Aww so happy you loved it, Martha! I’m so excited to make this Lasagna. All of your recipes that I’ve made are so delicious. I want to have this for Christmas Day when my niece and her partner are here. For sure I want to make it ahead of time, I see you said in previous comments that it would be fine to freeze, but if I made this on the 22nd would it hold in the refrigerator until the evening of the 25th, or maybe best to freeze? Thanks in advance. Merry Christmas to you and your family! BTW: love your show too. Oh I’m so happy to hear that Joe! It’s best if you freeze the lasagna, unless you are making it a day ahead and then baking it. If you freeze it, you can then bake it on Christmas. Have a yum holiday! Yay! Have a Merry Christmas, J. Thank you Paul! I’ll pass on your message to my crew. And Merry Christmas to you too. After seeing this on your show, I’m making this today. It looks amazing. Can I assemble today and bake tomorrow or is it best to assemble, bake today and reheat tomorrow? Thank you. Absolutely, Gayle! You can assemble and bake it the next day. Planning to make this for our family Christmas; I think my Mexican-American son-in-law will eat it up! I hope the whole family loves the lasagna, Inani! Have a very happy Christmas. I had to make this dish as soon a I saw the recipe. I don’t cook a lot by recipe and I didn’t read the whole recipe first. It took me 3 hours! Can’t wait to eat it! Oh all the hard work will pay off, Daniel 😉 Enjoy the lasagna. Pati, saw this on PBS and want to make for my family over Christmas! I live in Texas and all these flavors are perfect! I am gluten free and plan to use GF lasagna noodles, but everything else in the recipe is ok for a GF diet. I want to know if I can prepare this and then freeze it before I cook it which would allow me to make it a week or so before my family arrives. O would it freeze after it is baked in the oven? Please advise thanks! You can absolutely freeze it…it’s best to make it and freeze it before baking, but you can also bake and then freeze it. Have a Merry Christmas, Meg! Can I make ahead and freeze it ? You can, Marilyn! It’s best if you freeze it before baking, but you can also bake and freeze the lasagna. Oh I made this for my husband and a dinner he hosted. They loved every bite of it! Delicious! I love your show so much! Beautiful food & areas close enough to visit. Even though I’m rather chile “shy” I think your recipes will make my family so happy! Thank you for such a wonderful experience cooking delicious food! I’m beyond happy to hear that you are having a wonderful experience cooking, Dona! So glad you discovered the show and this lasagna, Carol! participating on the show every now & then. I will definitely try the recipe “Veggie Loaded Mexican Lasagna” as soon as I can & also the other recipes. Oh thank you Norma. I hope you love all the recipes! Made this today so easy and taste so great . I love lasagna , love you version. So happy you enjoyed it, Paul. Whoa!!! That is quite a bit of ingredients for lasagna. It is loaded. But-I know-you appreciate your fans; therefore, as soon as fall rolls in, I will try the recipe. I already had the lasagna (The cooking kind), the ricotta, and mozzarella before you sent us this new, creative, version. “Guess, I have to switch around”. Thanks! It is SUPER loaded, but super yum. Have fun cooking it, Rosanna. Patty, this recipe sounds muy deliciosa… looking forward to trying this during the upcoming holidays. Thx so much from a big fan in Massachusetts! Be well. I hope you love it for the holidays, Rob!